KEEP OUT OF REACH OF CHILDREN AND PETS. Do not exceed recommended dose. Consumer must be at least 18 years of age to purchase and/or use this product. Prior to using AMINO-TONE® consult a licensed physician if you are unaware of your current health condition or have any pre-existing medical conditions, if you are taking an MAO inhibitor or any other medication. Do not use if you are pregnant, nursing or contemplating pregnancy. This product may contain chemicals known to the State of California to cause cancer and/or birth defects or other reproductive harm. Niacin may cause temporary flushing, tingling, skin reddening, and sensations of heat, especially if taken on an empty stomach. This is a common reaction. Finally, discontinue use and consult your doctor if any adverse reaction occurs. Discontinue use 2 weeks prior to surgery. Store in a cool, dry place. Protect from heat, direct sunlight and moisture. Natural & Artificial Flavors, Citric Acid, Silica, Malic Acid, Sucralose, Acesulfame Potassium & FD&C Red No. 40. 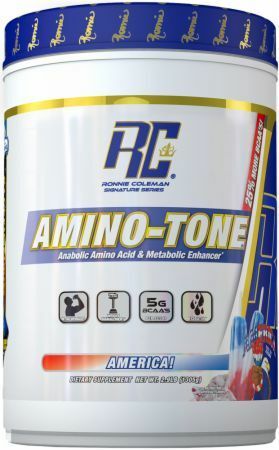 Citric Acid, Natural & Artificial Flavors, Malic Acid, Sucralose, Maltodextrin, Ace-K.
America This is a Buy 1 Get 1 FREE offer!